How do I add UTM tags to my landing page URL? Learn how to turn on auto-tagging, which lets Bing Ads automatically add UTM tags to your landing page URL. Bing Ads can automatically add UTM tags to your landing page URL so you can use a third-party tracking tool, for example Google Analytics, to track how people got to your website. Auto-tags are applied to text ads, keywords, Bing Shopping Campaigns, Image Extensions, Sitelink Extensions, and dynamic search ads. You turn on auto-tagging at the account level, and then Bing Ads automatically adds the UTM tags to the landing page URLs for text ads, keywords, Bing Shopping Campaigns, Image Extensions, and Sitelink Extensions. 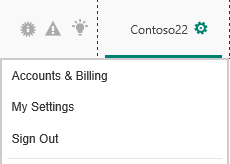 On the Accounts tab, click the edit icon . Next to Auto-tagging, select Add UTM tags to my landing page URLs. Choose to either replace all existing tags, or instead keep the tags you already have and have Bing Ads just add any that are missing. The first option will remove any UTM tags you already have and add the tags described below. The second option will simply add the tags below to your existing tags. Bing Ads automatically attaches the following UTM tags (parameters) to your landing page URL when it loads. The tags are added in the order shown below from top to bottom until the maximum length of the URL is reached. utm_source The site that sent traffic to your page. Bing Ads sets this to Bing. utm_medium Which channel was used. Bing Ads sets this to cpc. utm_campaign Which campaign the keyword came from. utm_content Which ad group the keyword came from. utm_term Which keyword brought people to your website. For product ads, what Bing Shopping product group (Criterion ID) brought people to your ad. Auto-tagging appends the UTM tags at the end of the URL, after any URL parameters. To learn more, see What is URL tracking in Bing Ads? Auto-tags are added when the ads are displayed. Regardless if you choose to replace all existing tags or keep existing tags and add any that are missing, you will not see your landing page URL updated with the new tags. Those tags only get appended when the ad is actually displayed to a search user. Auto-tagging will only work if your website allows arbitrary URL parameters. Check with your website administrator to verify if this could be an issue for your site. If it is, you can manually add tags instead. This structure is the same across all analytics tools. After you have this tracking information added to your URL, you can use your favorite analytics application to review the information. However different analytics tools can have different URL tracking parameters. Refer to the documentation for your own tracking tool to see what is available to you. Bing Ads also lets you manually add tracking parameters to your landing page URL. To learn more, see How do I set up final URL tracking?